I never really put much thought into the health of my scalp, yet I know it’s one of the most important parts to our overall appearance. At the end of the day, my hair can look super flat because of excess oil! 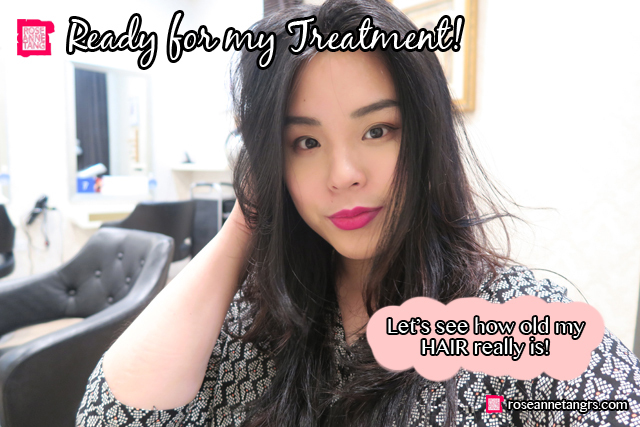 So when TK TricoKare invited me to try their new anti-ageing hair treatment – Advanced Age Defying Hair Treatment, I was curious to see whether it would make a difference to my hair at the end of the day. I was both impressed and happy with the results and I can’t wait to share them with you. TrichoKare’s customised treatments are all validated by certified Trichologists – specialists who study and diagnose hair and scalp problems, giving clients an added assurance of its effectiveness. It uses European herbal hair remedies which are free from harsh chemicals to ensure optimal results for each individual’s condition. 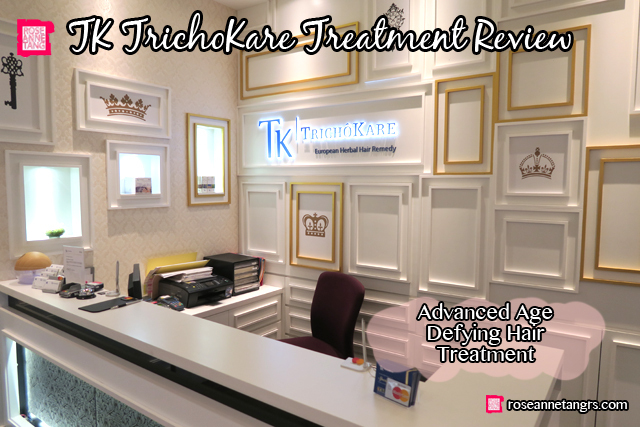 In Singapore, TrichoKare has won numerous awards – the Elle Beauty 2017 – Best Treatment For Hair Loss, Her World Spa awards 2016, Bazaar Hair Awards 2016 and Women&#39;s Weekly Hair Awards 2016! Local celebs such as Jaynesh and Anand have visited Trichokare as well to have their hair problems solved – promoting healthy hair growth, preventing hair fall and hair loss. Personally, I feel that this is a really great solution with people who have problems with hair fall and loss, or just sensitive scalp problems. We put so much into our face, but forget our scalp. During our consultation, my scalp was scanned to see it’s condition. I wasn’t surprised with the amount of oil and dry flakes I saw. 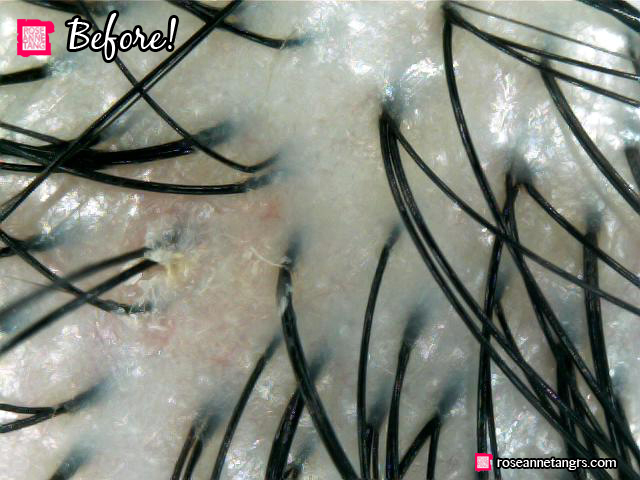 A really healthy scalp is one with large open pores and thick hair. While I have thick hair strands, but my pores appear more clogged than usual – probably resulting in my flat hair at the end of the day. During the consultation, my hair expert has mention that “Like skin, hair also ages intrinsically. As you age, your hair goes through a severe transformation.” Ever wonder how old your hair is compare to your actual age? 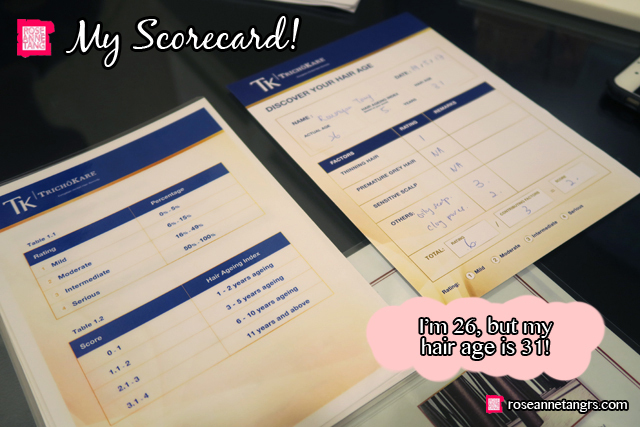 I found out my real hair age with the TrichoKare’s Advanced Tricho Hair Test. My hair is 5 years older than my actual age, so my hair age is 31! The hair expert has explained that it’s due to my lifestyle, diet which results in having a greasy scalp and clogged pores. 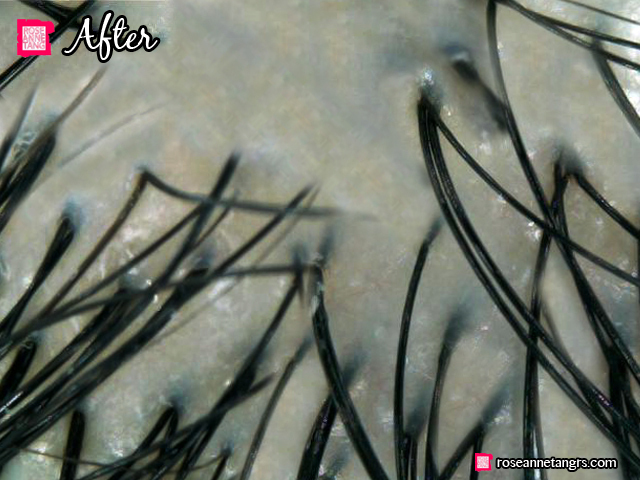 This decrease the nutrients being delivered to hair follicles and preventing new hair growth. 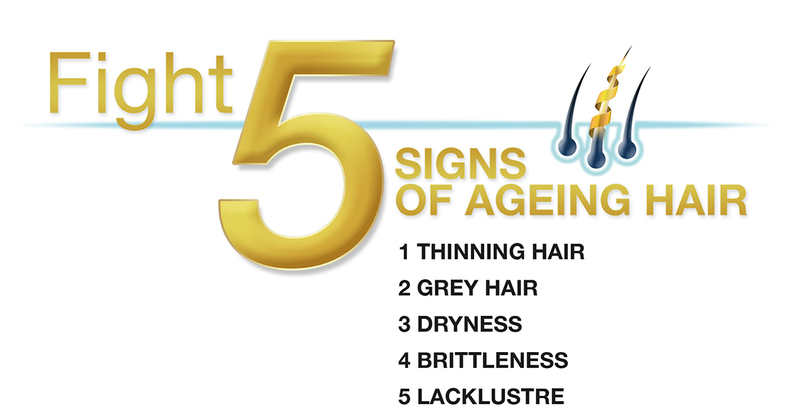 I was prescribed with the Advanced Age Defying Hair treatment which helps to fight signs of ageing hair. The Advanced Age Defying Hair Treatment is specially developed to help both men and women counteract age-related changes in the density and diameter of their hair. 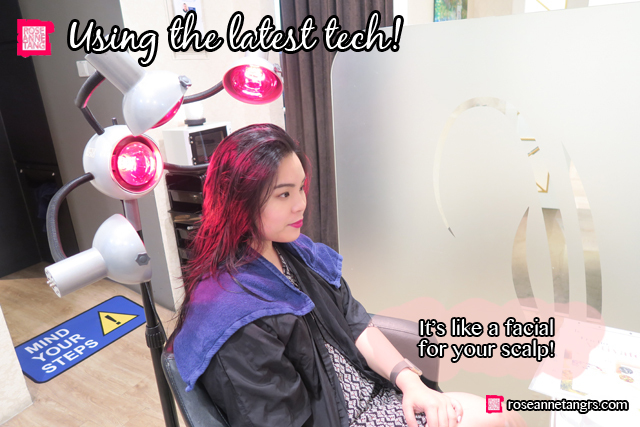 After the treatment, you can really see my scalp looked and felt a lot cleaner! My pores are VISIBLY OPEN, there was no more pasty build up and dry flakes as seen in the after scalp scan image and you can clearly see my roots now. *Note: This is a different area of the scalp than my before photo but as you can see, the amount of dead skin is much more reduced and there is much less oil. Seriously, my scalp not only felt super clean, I didn’t feel my hair is limp and flat even till the end of today which was really a massive improvement. My scalp just felt so much lighter and I experienced little to no hair fall throughout the day. This was a HUGE relief for me and I highly recommend trying the scalp treatment at TrichoKare if you’re in a similar situation! If you have a flat hair or any scalp problems and would like to restore your hair back to a head of thick, youthful hair, good news! 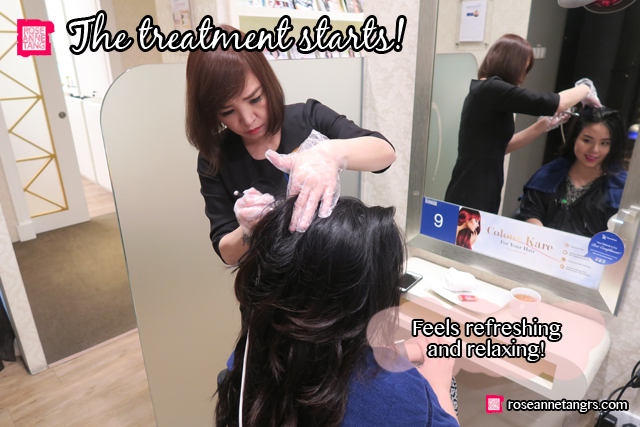 Try TrichoKare’s Advanced Age Defying Hair Treatment @ $40 ONLY and receive a Free Hair Care Kit + HairGRO Serum (U.P. $758). Thank you to TrichoKare for sponsoring this post and allowing me to try my first scalp treatment. It was for sure enlightening and delightful experience. Hi Rosean. You really have a beautiful long hair. Must be not too easy to take care of.